Chelmunds Court care home in Birmingham has reopened to new residents after coming out of special measures. The home, which was rated ‘inadequate’ twice in 2018, was upgraded to ‘requires improvement’ following an inspection in January. 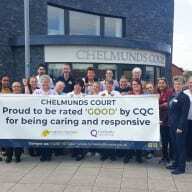 Local authority partner, Solihull Council, said: “Solihull Council recognises the improvements that have taken place at Chelmunds Court following the publication of the Care Quality Commission’s (CQC) recent inspection report. Progress at the service came as a results of the installation of new management and a robust improvement plan. A Runwood Homes spokesperson said: “Faced with challenges during the first few months of operation, the home saw an inadequate CQC report in August 2018 and an admissions embargo. With new management placed, Runwood Homes instantaneously implemented a vital action plan to rapidly improve the service, realising the good quality standard that the organisation expects. The post Care home reopens to new residents after coming out of special measures appeared first on Care Home Professional.